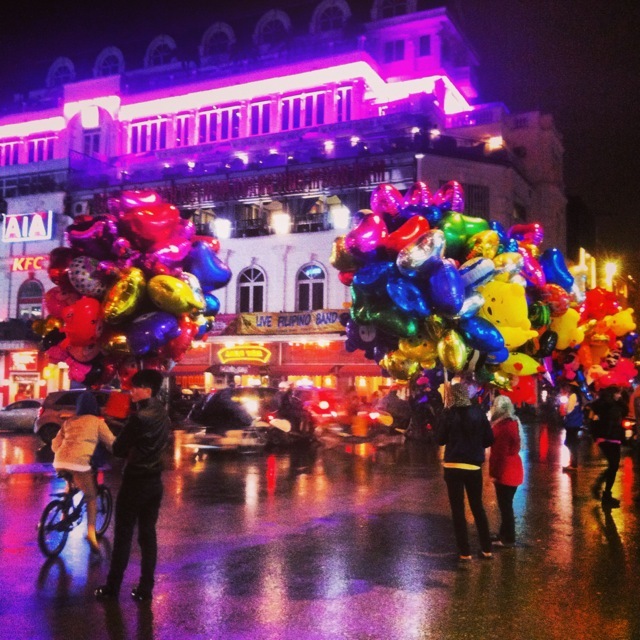 Is it a good morning Vietnam? 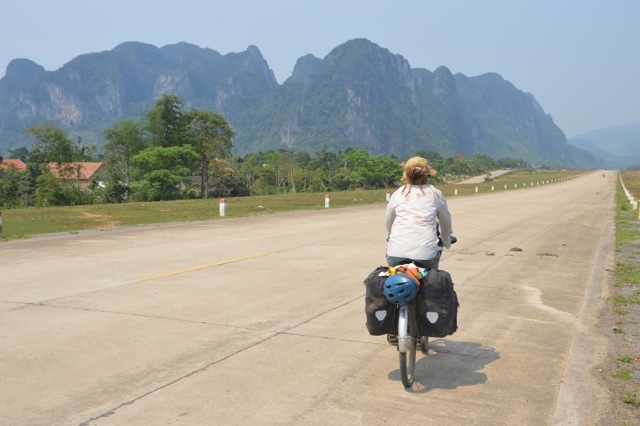 Every country radiates a different energy and the one that I felt when crossing into Vietnam was something akin to desperation. Added to this, the border town smelt like urine, there was garbage strewn everywhere, the road disintegrated and grim faces looked out of dank grey houses. As I watched the scenery through the bus window I lamented how often ideologies, like communism, are ruined in practice by the corruption of people. We were to learn that as with other dictatorships, corruption in Vietnam continues to be endemic and as the saying goes “money talks”. 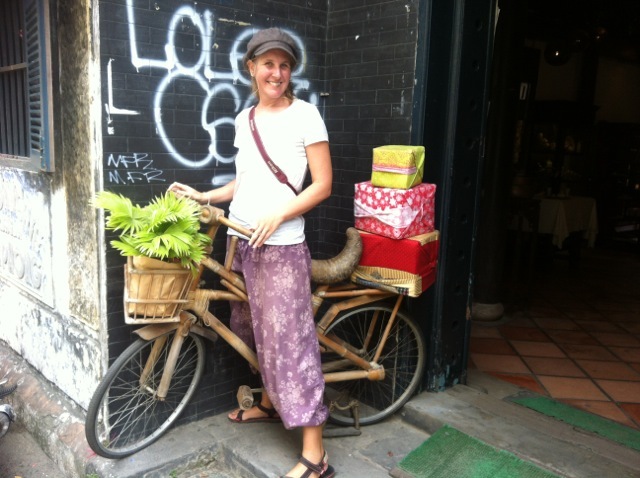 Sellers walk the streets carrying their wares on bikes or their backs. 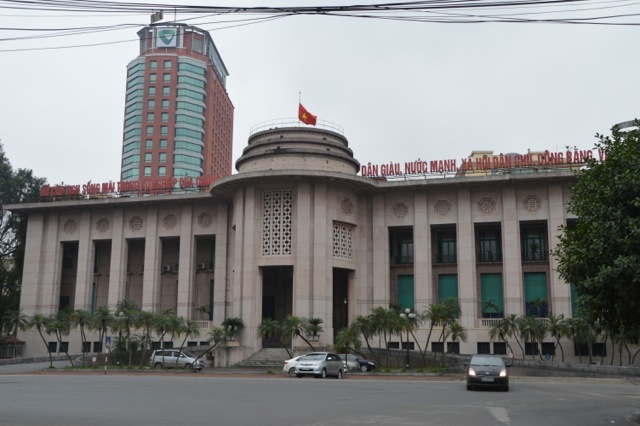 Soviet style building are everywhere in Vietnam. The old city walls, with mum, Jude, Marita and Ben. Old cyclos in front of the Metropole Hotel. 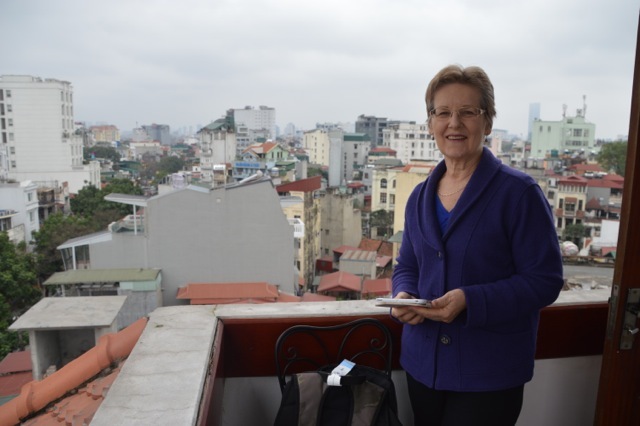 Fortunately our main reason for visiting Vietnam was to spend some quality time with my mum Ilze, who was flying into Hanoi to visit us for a fortnight. 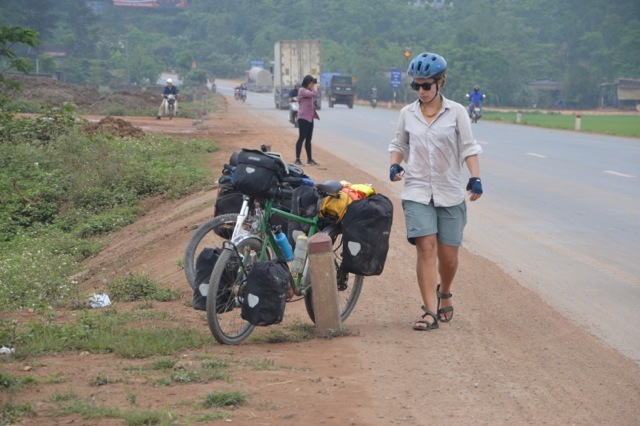 Mum had booked us a lovely hotel room for the first couple of nights and you know that you look like a bum when the staff eye you disparagingly as you rock up on your mud covered bike dressed like a hobo backpacker. 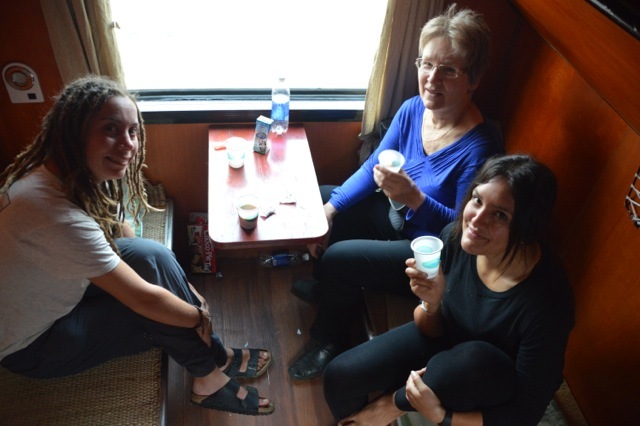 They quickly learnt not to judge a person by their looks and we were soon sharing a cup of tea together. Anticipation had been building in me all day and when mum walked through the door we hugged like we would never let each other go. 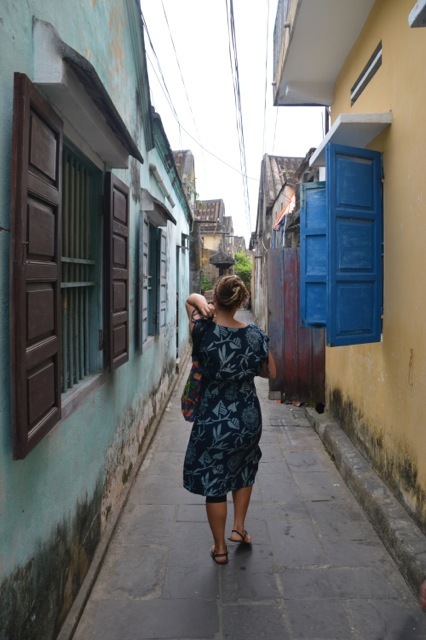 I had planned to show her around the city that afternoon, but time warped, and we spent the whole afternoon chatting over cups of tea and treats that mum had brought. 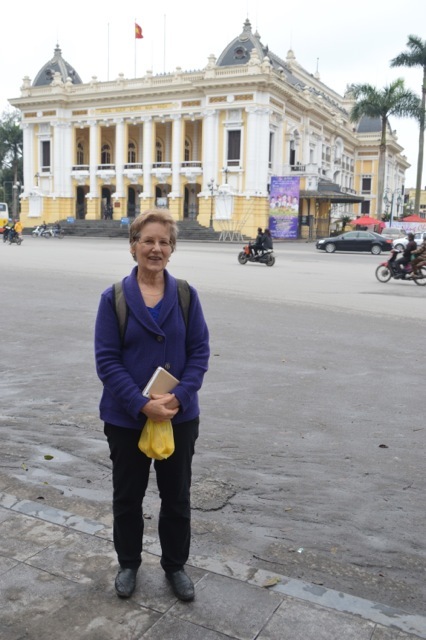 The Opera House, a lovely example of French colonial architecture. 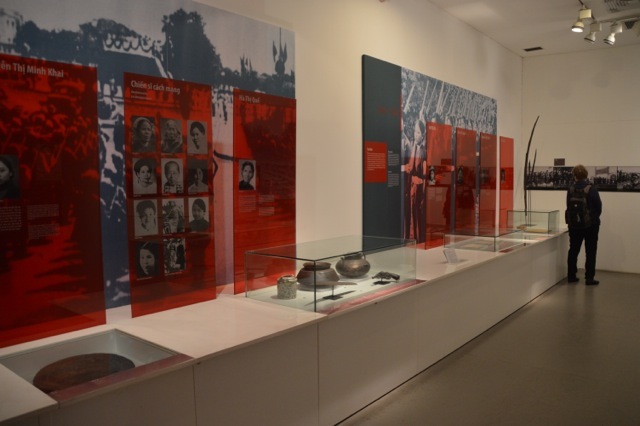 Looking at the displays in the Women’s museum. Entry gate for the Temple of Literature. 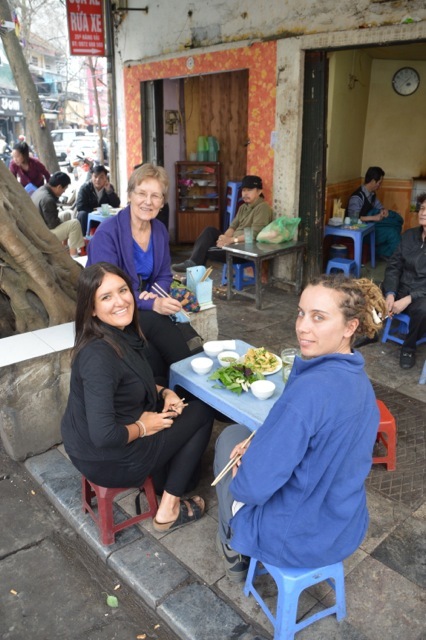 Our time in Hanoi was shared between sightseeing and relaxing in lovely cafés. We roamed the Old Quarter where shop keepers have pedalled their wares for a thousand years, every street named after the produce sold in its’ stores. 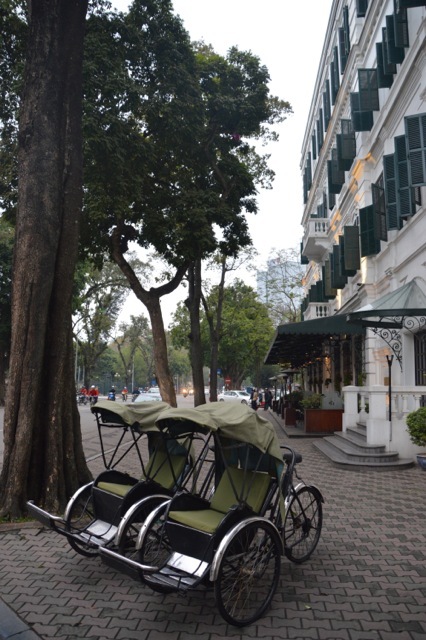 We strolled around Hoan Kiem Lake and imagined the grandeur of old Indochina from the colonial architecture in the French Quarter. 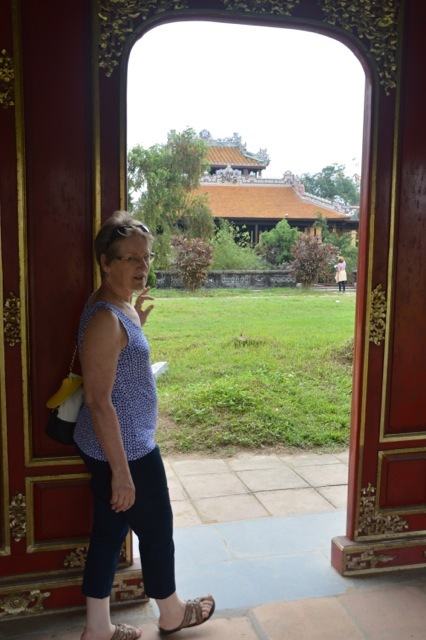 We admired the bravery and resilience of Vietnamese women as displayed in the Women’s Museum; the beauty of Vietnamese arts and crafts at the Fine Arts Museum; and the people’s dedication to education at the Temple of Literature. Our taste buds were tantalised with a variety of different noodle soups, street eats, roadside barbeques and the highlight of a chocolate buffet high tea in the grand surrounds of the Metropole Hotel – decadence at its best! This place smelled so good we had to give it a try. Decadence plus, chocolate buffet high tea. Happy to be hanging out with mum. 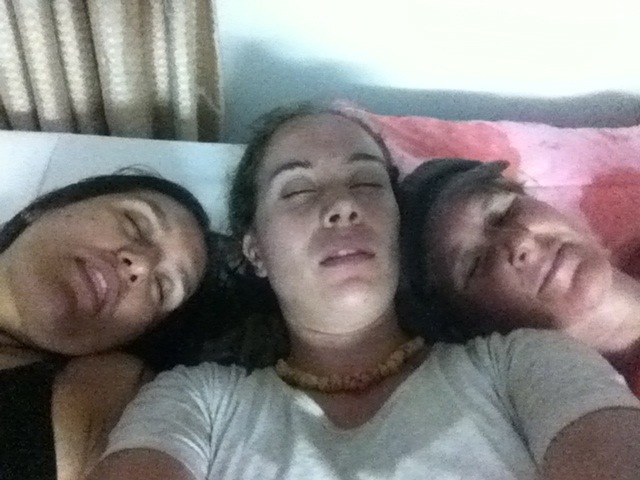 We were all a little bleary eyed from the night train, in need of coffee and croissants. 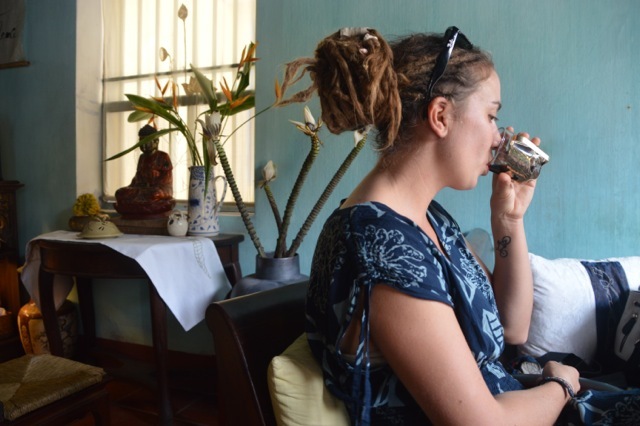 An overnight train journey delivered us to Hue, and on arrival we located a French bakery where we revived ourselves with coffee and croissants. Chance fortune smiled on us that day, when we stumbled upon Jess and Charlotte (from the megapod). They were heading north that evening so we had a girly afternoon of drinking wine, eating comfort food and chatting, before we waved them off. 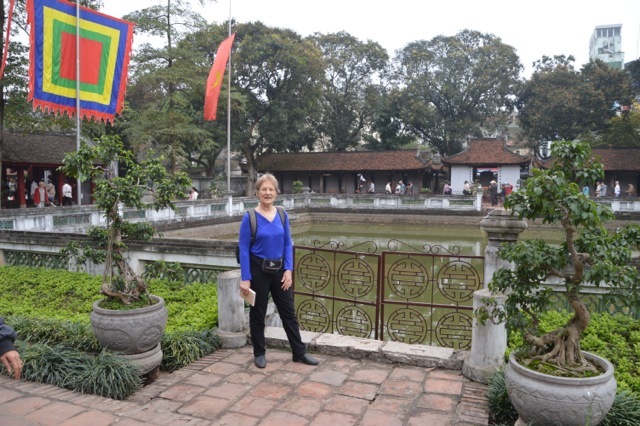 The next day found us exploring the ancient imperial citadel and palace of the Nguyen Dynasty. 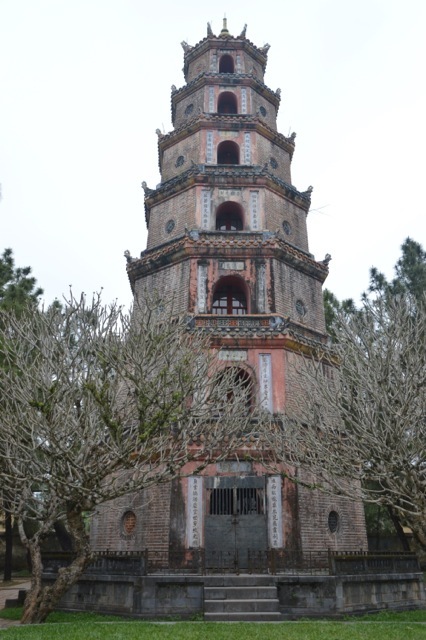 Bombing during the French and Vietnam wars destroyed most of the buildings, yet what remains is still impressive. Girly afternoon with Jess and Charlotte. 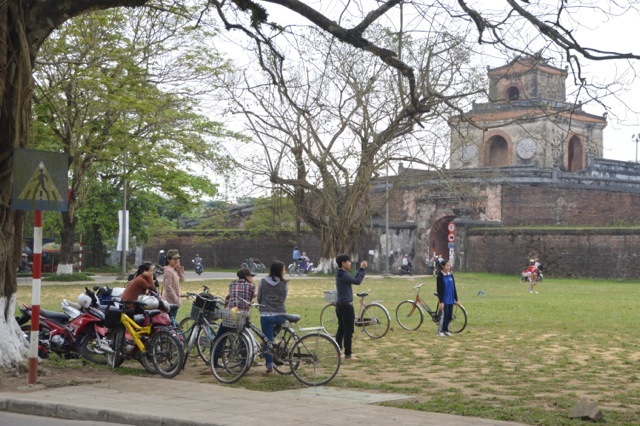 Locals relaxing around the citadel walls. East gate of the Palace. 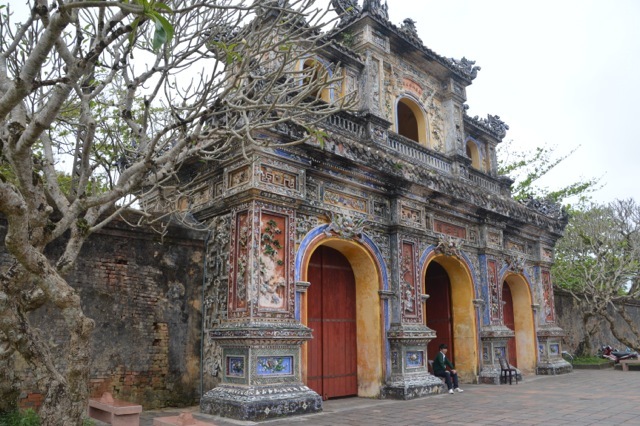 Main building of the palace where the emperor held court. Overlooking the Emperor’s reading room. 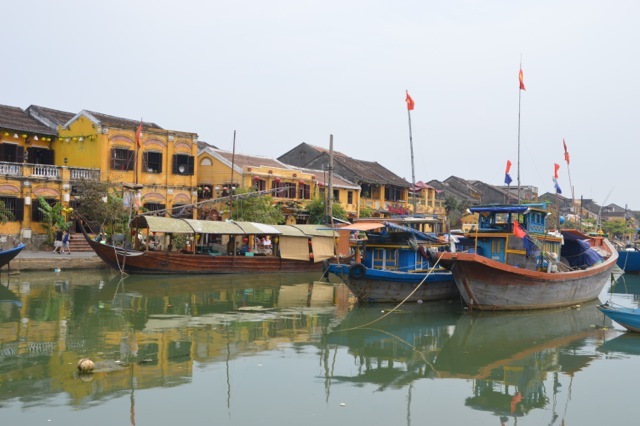 In Hoi An, a week of gourmet living ensued. 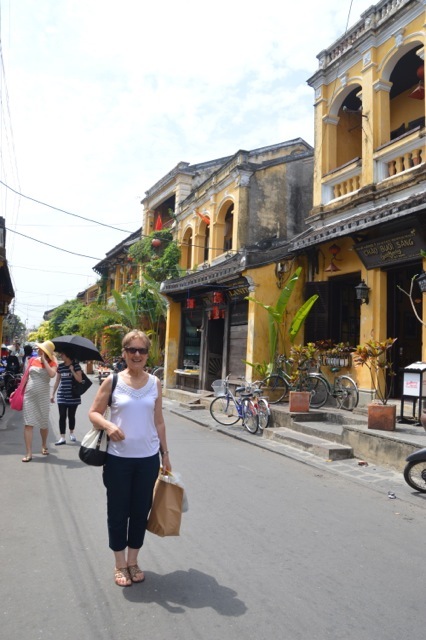 The old town has been beautifully restored and we spent hours wandering through the streets and alleyways. 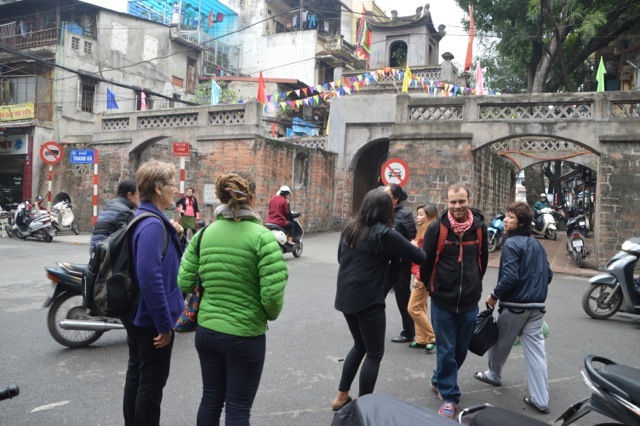 Unfortunately tourism is the main industry here and as such much of its Asiatic charm has been lost. The only locals are the ones running the businesses and most of the time I felt like I was somewhere in Europe. 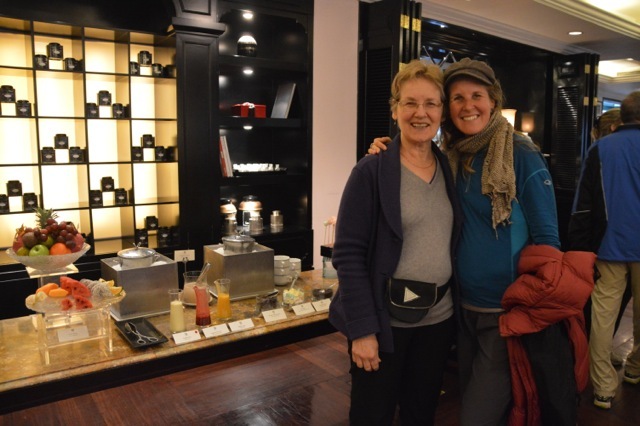 Though when in Rome… So we had some clothes tailor made (yes I am the proud owner of knickerbockers and bright red pants) and we dined at top class restaurants. We escaped the crowds with an overnight trip to the Cham Islands where we spent the day relaxing and swimming at a secluded white sand beach (if only the wind wasn’t whipping sand everywhere). 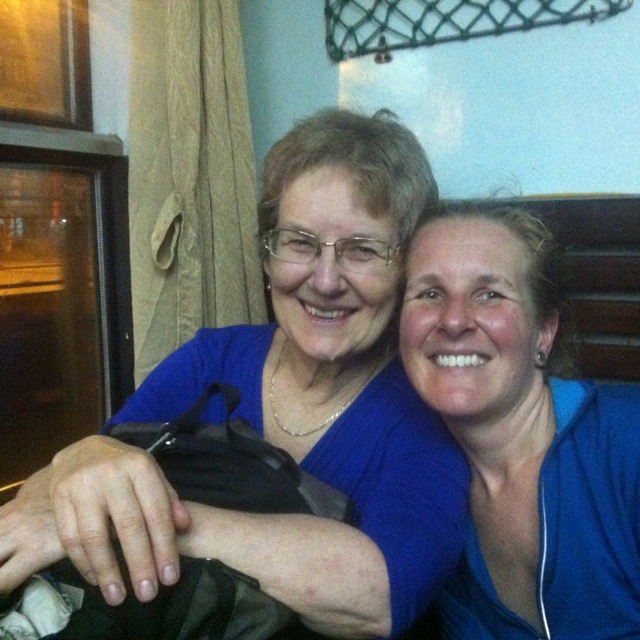 But best of all, I spent lots of time with my mum. The morning she was leaving I watched her with a heavy heart and tears in my eyes knowing I wouldn’t see her or hug her again for another year. Time like we had is so precious and for it I will always be grateful. Thanks mum for coming to visit, I love you very much and can’t wait till we are together again. 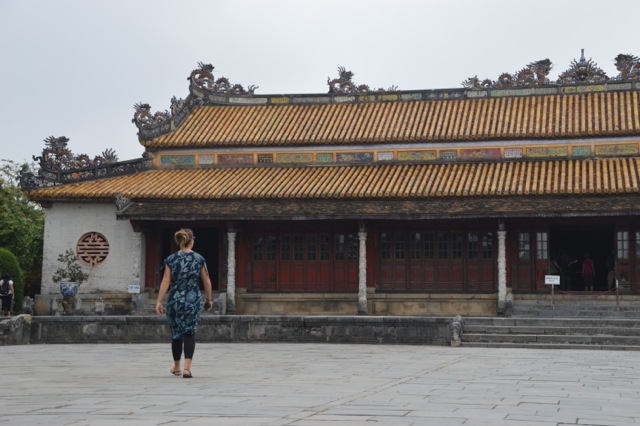 Hoi An has been beautifully restored. Enjoying a spot of shopping. The heavy heart remained, so the following day we had a ‘cycling fail’. Instead of riding we holed ourselves up in our room with a few bottles of red wine and watched a whole season of Rake in our underwear. 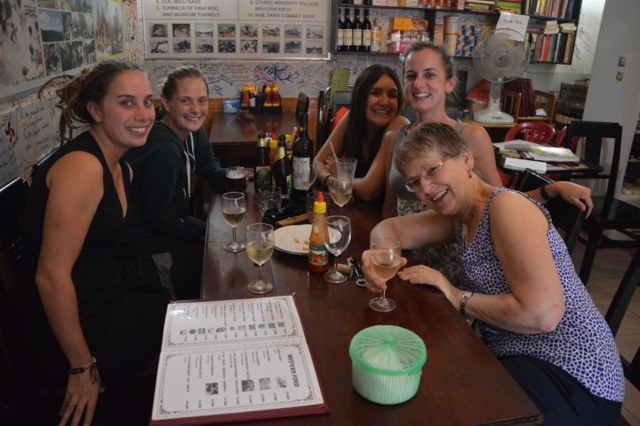 In addition, we had planned on leaving Vietnam as soon as possible but after looking over calendars, visa requirements and maps we found that we needed to spend an extra week in Vietnam. In all honesty we really disliked the place, actually to be more specific we disliked most of the people. 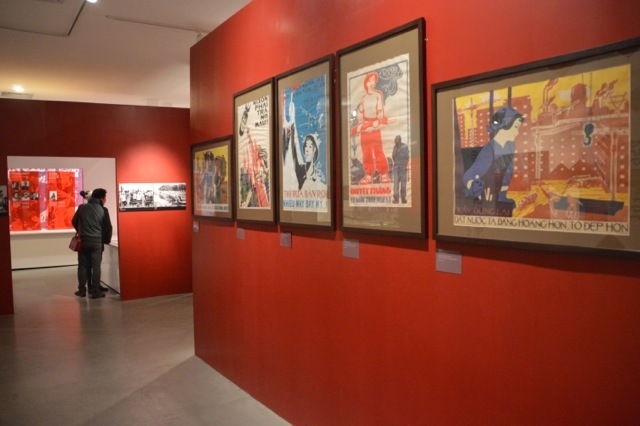 Interesting that for a communist country, capital seems to be the only culture that is of any value to the people. 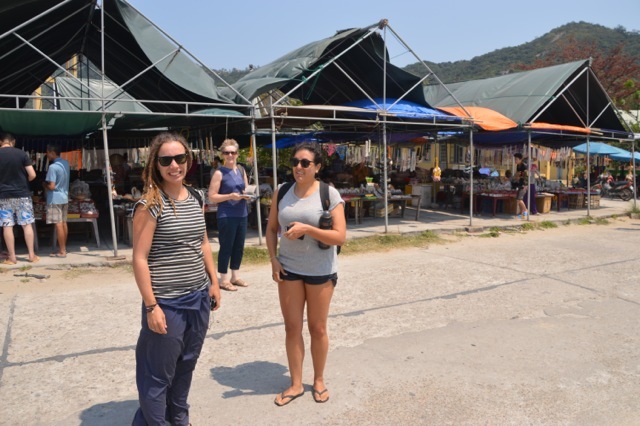 Arriving at the Cham islands. Seeing that we had not cycled for two weeks, it may have been a good idea to ease ourselves gently back into the swing of things. Being us though, we decided that it could be a great opportunity to break our ‘longest distance cycled in a day’ record. 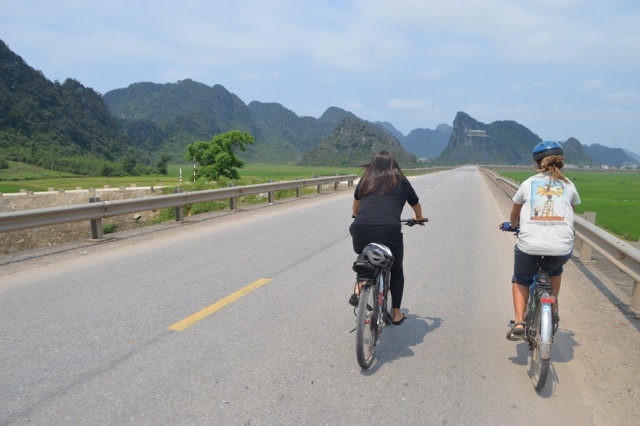 After a buffet breakfast (you know how much we love them) we set off for our 140km cycle to Hue. It felt great to be back in the saddle and we sped along the coast happy not to be restrained by the confines of public transport any longer. 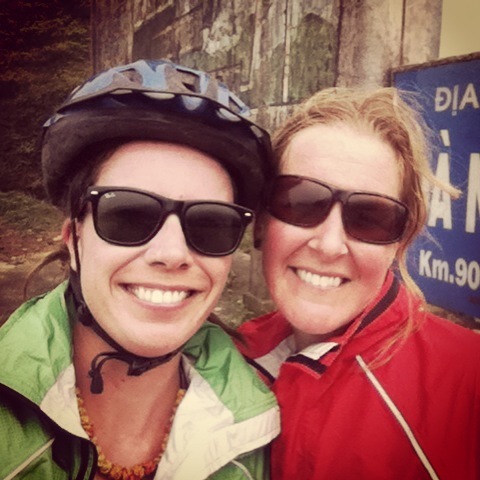 Not even the 10km climb up the Hai Van pass could dampen our spirits. The views back along the coast were as breathtaking as the climb, and we were lucky enough to reach the summit just as the clouds began to roll in. At the summit we were mobbed by sellers all wanting us to buy, buy, buy. Nothing new there, except that they followed Marita into the toilet, tried to charge her 10 times the normal price to use the toilet (there was no sign about payment) and then hit her when she refused to buy anything. I can just imagine what customer service representatives in Australia would say about such tactics. 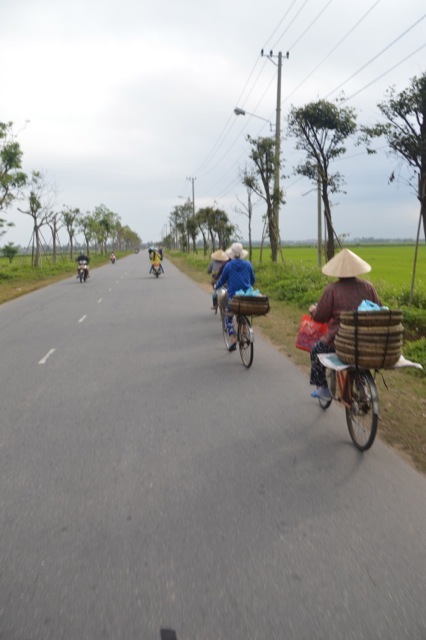 Cycling out of Hoi An. The views back along the coast were breathtaking. 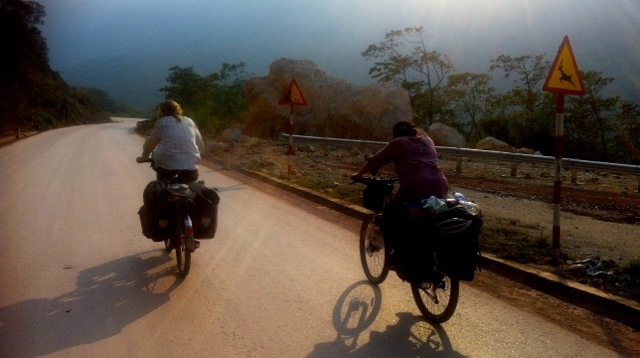 Climbing the Hai Van pass. 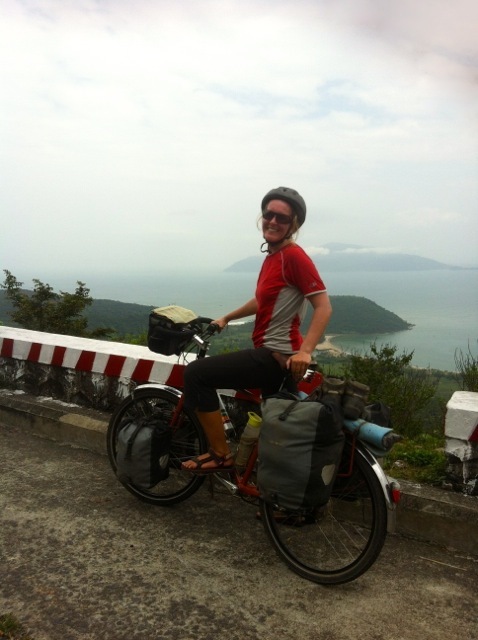 Happy to be at the top of Hai Van pass, until the sellers started to mob us. How we felt after 140km. Probably the same thing as the Australian driving standards regulators, if they saw how the Vietnamese drive. Despite poking fun in Indonesia about them stopping on the wrong side of the road on a blind corner to smoke a cigarette, I can honestly say that the Vietnamese are the worst drivers in S.E. Asia. Crazy and dangerous, and obnoxiously loud when they blast their horns next to us as we cycle passed. After 100km we were sick of the drivers, the noise and we were getting tired. Maybe 140km on the first day wasn’t such a great idea. To keep me focused I started dreaming of the delicious Indian dinner I would soon be eating. It worked, but not before darkness settled and we had to ride the last 20km without lights. On our arrival we were given the best room in the hotel with 360-degree views of the city and we celebrated our ride with a mango lassi and a delicious curry. 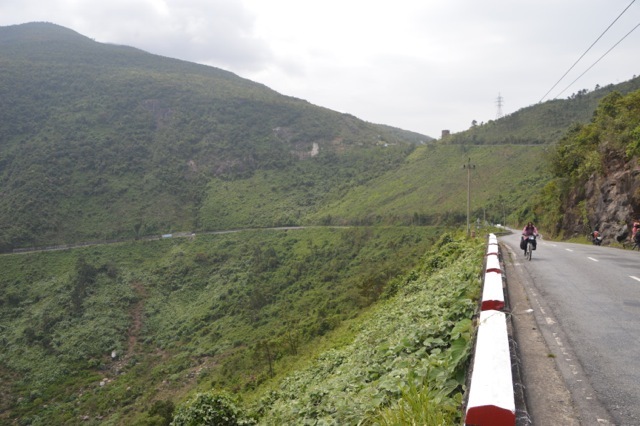 On the road to Dong Ha. 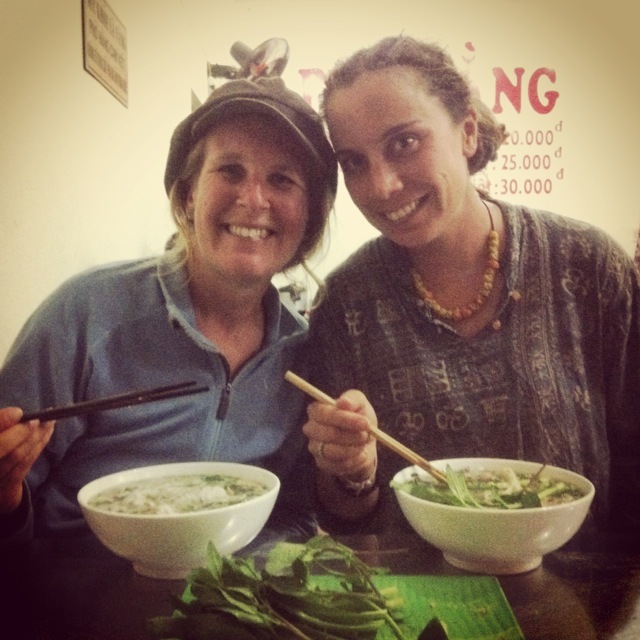 To eat the best Pho ever (in Dong Ha). 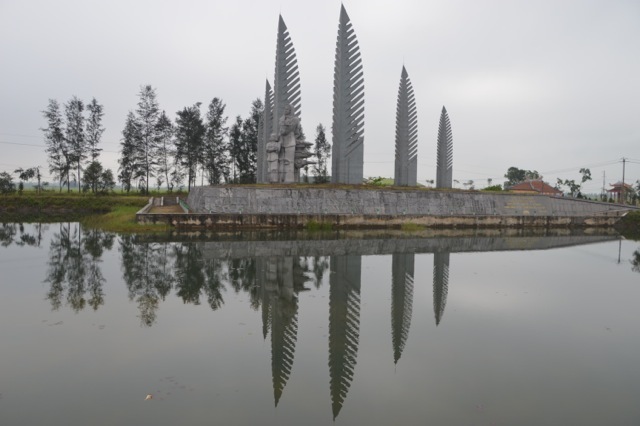 The memorial marking the DMZ, the most bombed area during the Vietnam war. 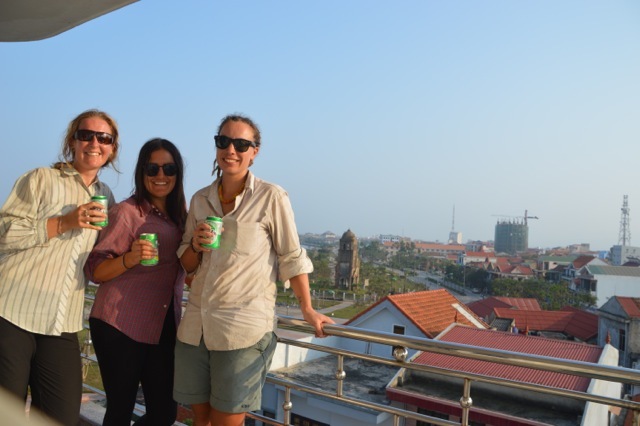 Sunset beers in Dong Hoi. 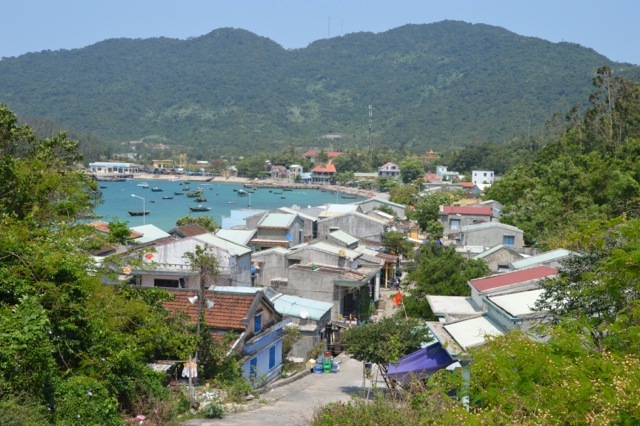 The next two days found us cycling first to Dong Ha and then to Dong Hoi. 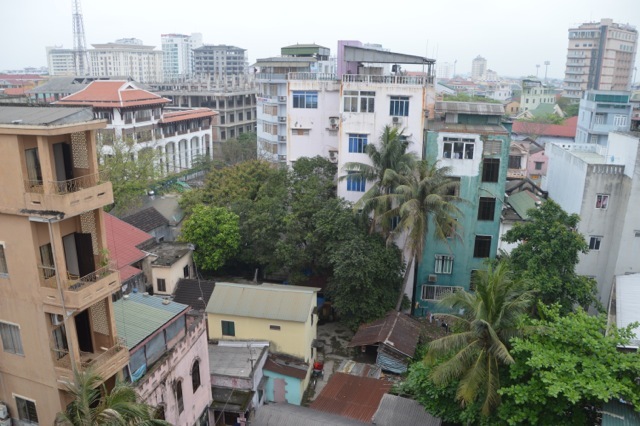 Both were prosperous sister cities before the Vietnamese War saw the area divided and the Demilitarised Zone drawn between them. Unfortunately the terrible traffic was never ending, the horns so loud we couldn’t think, we were again hit for not buying produce in shops and were the centre of attention for sleazy men. One confrontation culminated in Jude having to push a guy, as he didn’t get the message that we weren’t interested. Dong Ha, being on the ‘losing’ side of the DMZ, ended up being the poorer sister but we loved our time there all the same. 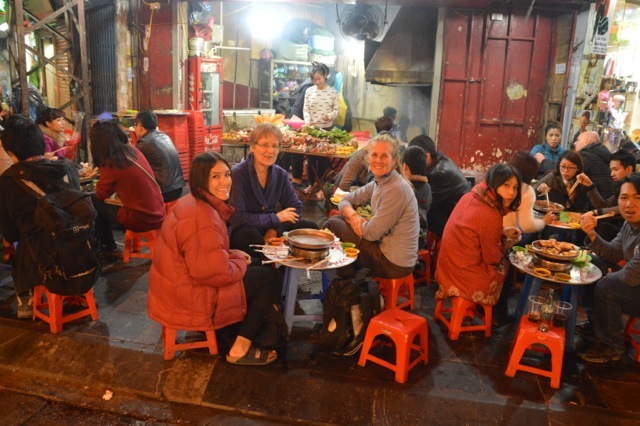 We rode the streets at night watching life go by, we ate the best Pho we have ever had, and we had the pleasure of meeting Tam of Tam’s café (who is one of the most community minded people I have ever met). Dong Hoi provided the glitz and glamour as we drank beers on the balcony watching the sunset over the city and the river. Marita fixing her first flat. Coffee and pancake break turned into a couple of days of R&R. Catching up on some reading and Skyping with family. 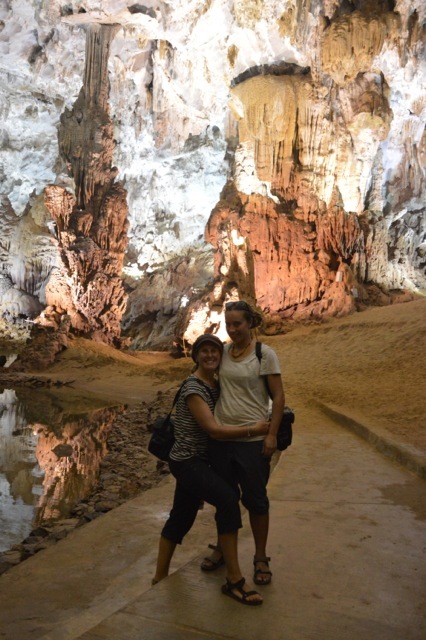 The caves near Song Trach had come highly recommended by our mate Ben, so we pedalled on to the Ho Chi Minh road and headed west. 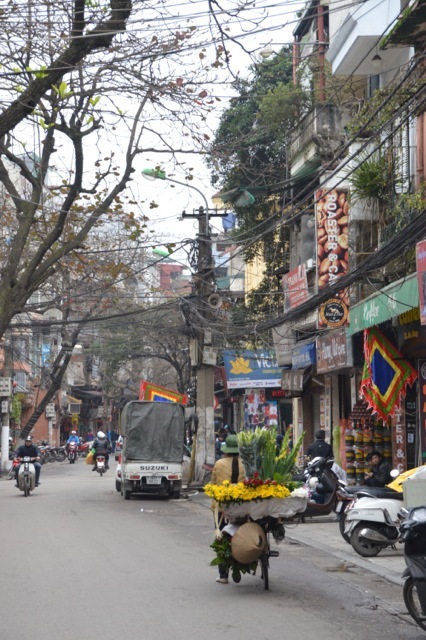 Ah to be free from the mayhem of (sub)urban Vietnam. 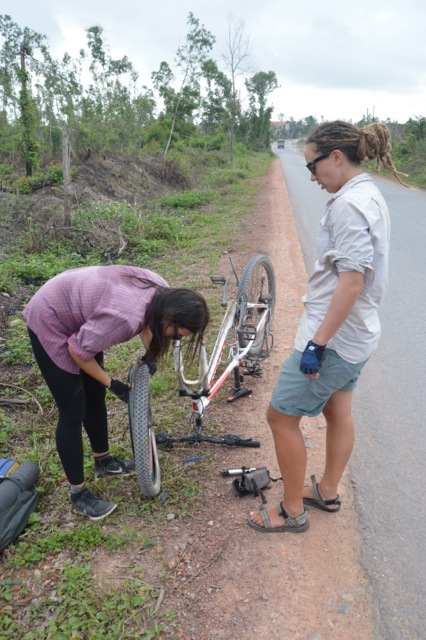 On the way, Marita experienced her first flat of the journey and with a little instruction from Master Jude she had the tyre fixed in no time. 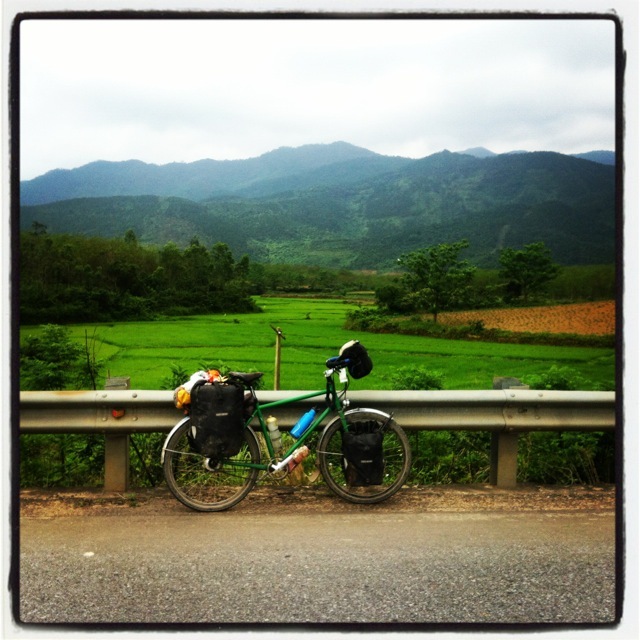 We continued to enjoy the tranquility of rice fields surrounded by mountains and chatted excitedly about the future. 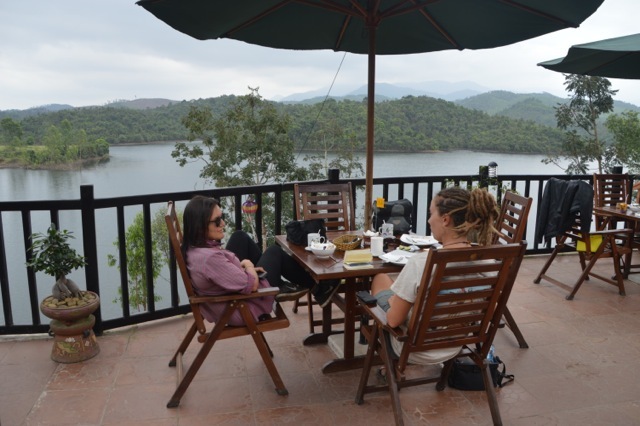 As it was a short days ride we stopped for a coffee and pancake break at the Lakeside Resort. 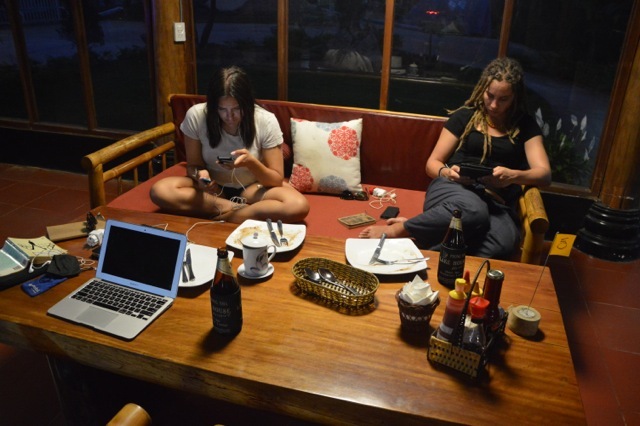 The place was so relaxing and familiar we decided to stay and make it our base for a couple of days. I think we were a bit frayed from the last few days and we were also quite homesick, so a little R&R was required. 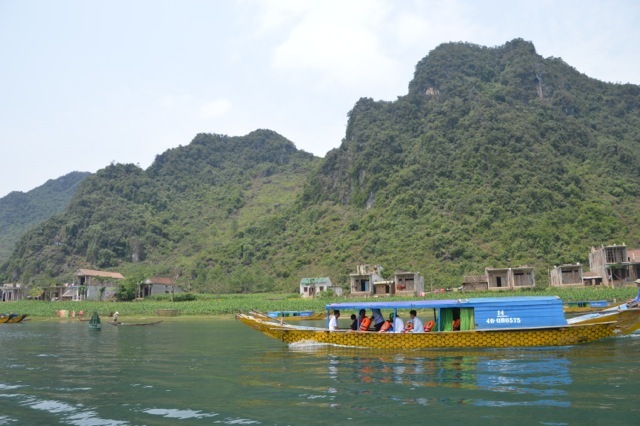 Boating up the river to the caves. Paddling up to a fairyland. 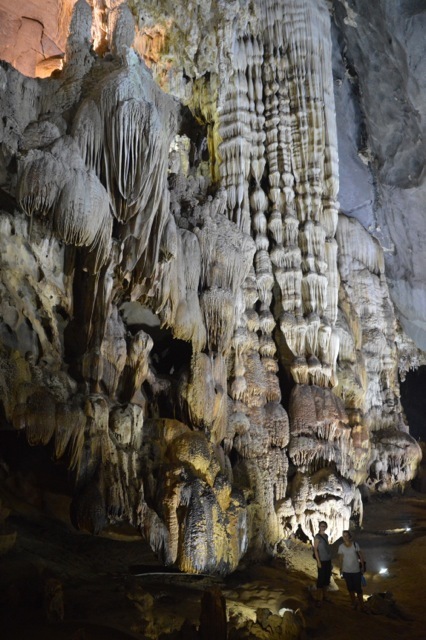 Excited to be at the caves. Standing under the giant jellyfish and its babies. 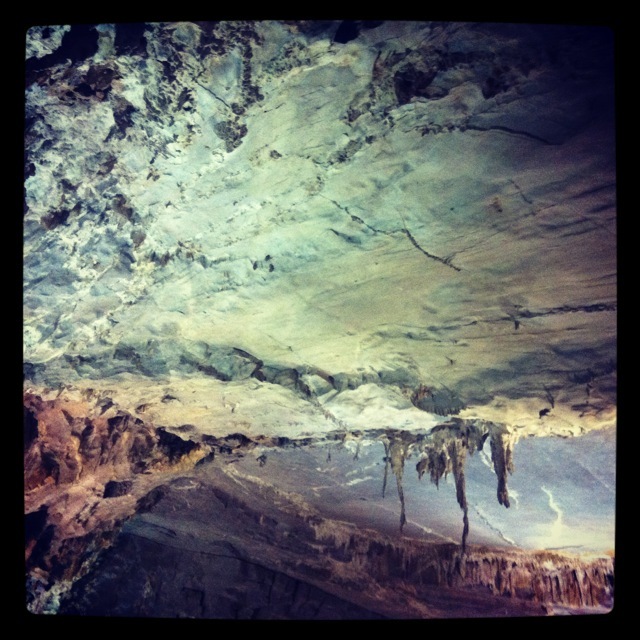 Ben was right, and the caves at Son Trach are well worth the visit. After a little incident involving being punched by two boys and me stomping on their bike in retaliation, we arrived at the tourist office in town. Due to the big spending of the last fortnight we had to keep the purse strings tight, so we chose the cheapest tour option. 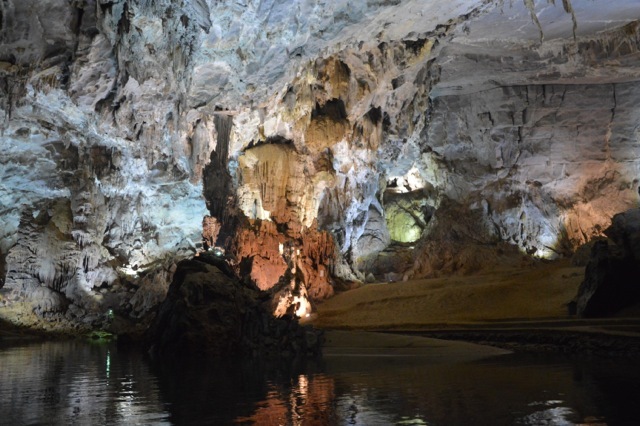 In no time we were on a boat cruising upstream between limestone karsts and at the cave entrance the motor was cut and we were paddled into the cave, which had been wonderfully lit up like a fairyland. On the way out we were dropped off at a sandy beach and were able to walk amongst the stalactites and stalagmites for as long as we wished. Never before had I seen such varied formations, one even looked like a giant jellyfish giving birth to hundreds of baby jellyfish. The green fairy almost camouflaged. 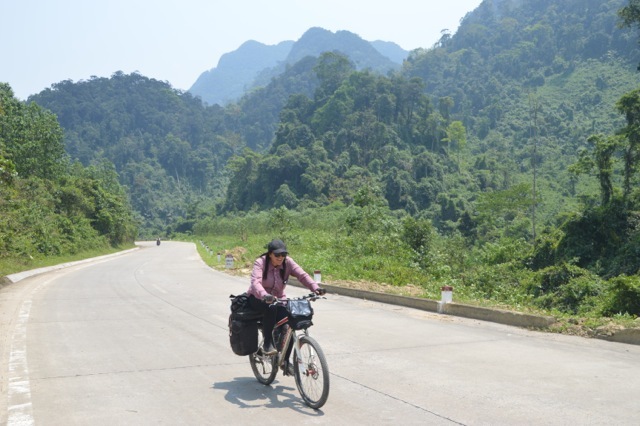 Cruising along the Ho Chi Minh Trail. 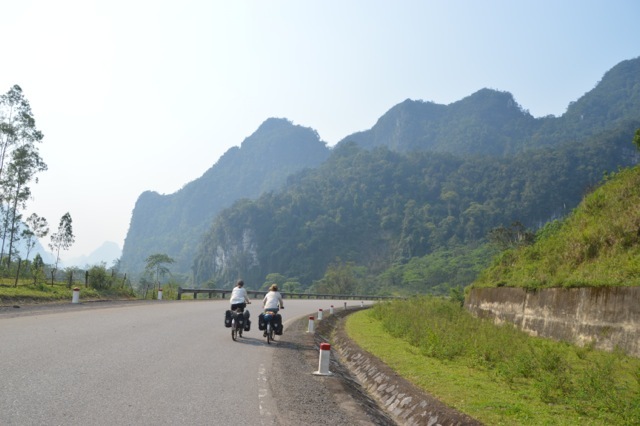 The R&R had to come to an end as the border and Laos were waiting. 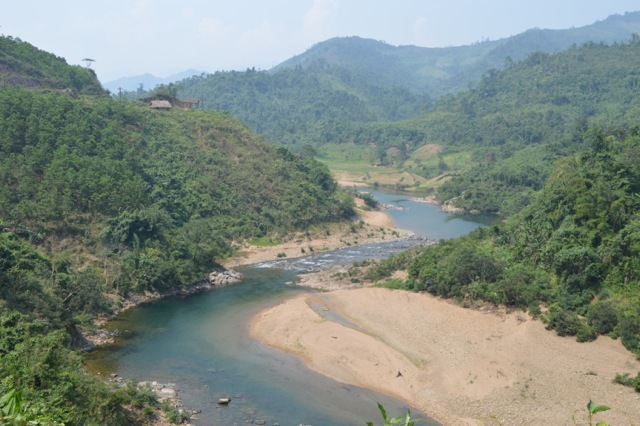 The Ho Chi Minh trail wound its way through karst country, rice fields swaying in the breeze, buffalos chewing cud in the paddocks, pigs and chickens wandering between wooden houses and children swimming in the rivers. It was idyllic, a far cry from everything we had experienced thus far. We camped in a field that night and I think I may have scared a farmer herding his cows when I popped out from behind a bush to say hello. Fireflies lit the sky that night providing the perfect ending to a perfect day. Well not such a perfect ending due to the leeches, but close enough. The heat was a killer. So we found ways to cool off. Heat seemed to be our main problem now and finding ways of keeping cool were fun. We splashed about in a river and ate watermelon on the banks. We found a water tank that was overflowing and jumped under it for a fully clothed shower. 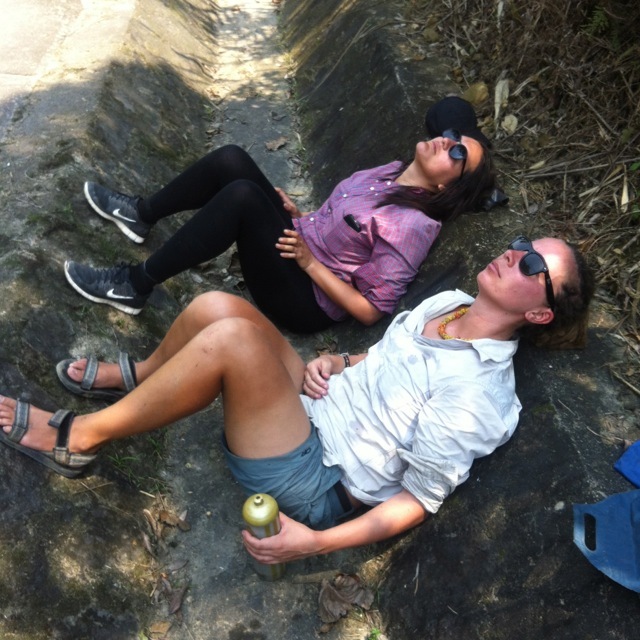 We lay in the shade of trees and ate mandarins and napped to rest. I even considered joining the water buffalos in their mud pools, but logic got the better of me. The heat and hills continued, and we were lucky to make it to the border just before closing. The immigration officers on seeing how hot we were positioned their fan on us as we waited. 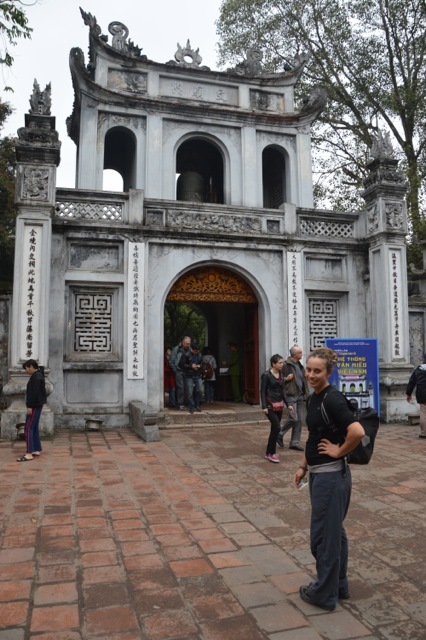 This small act of kindness and the beauty of the last two days almost made me forget how much I disliked Vietnam. Was I sad to go? No. Would I ever return? Probably not. But it is all an experience and that is what this journey is about. Happy to be cycling towards the border.